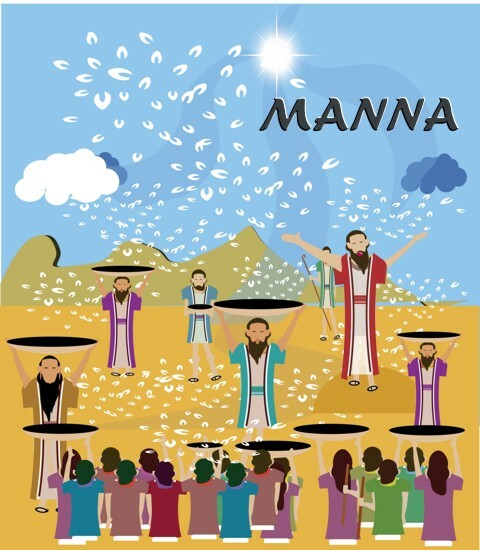 What Was Manna In The Bible? What is “manna” that is mentioned in the Bible? Why was it mentioned in Scripture in the Old Testament and even in the New Testament by Jesus? When God miraculously provided for the children of Israel in the wilderness, He sent them manna and this is what the psalmist called “the bread of heaven” (Psalm 78:24). The Israelites grumbled about starving to death that it had been better if they had “died by the Lord’s hand in Egypt! There we sat around pots of meat and ate all the food we wanted, but you have brought us out into this desert to starve this entire assembly to death” (Ex 16:3). The Lord then informed Moses that He would “rain down bread from heaven for you” so that they wouldn’t go hungry (Ex 16:4). That evening there were “thin flakes like frost on the ground appeared on the desert floor. When the Israelites saw it, they said to each other, “What is it?” For they did not know what it was” (Ex 16:14-15) and the word they used for “what is it” is really “manna” so manna means “what is it?” The Hebrew word “man” means “what is it” and that is what manna is. Manna was the answer to what it was that they needed. Jesus quoted Deuteronomy 8:3 when He was tempted by Satan in the wilderness to have Him turn the stones into bread. Jesus said that we are not to live by bread alone but “by every word that comes from the mouth of the Lord” (Matt 4:4) meaning we are to live by every word that God has delivered from His own breath (2 Tim 3:16) and every word of God is found in the Bible. When the people asked “What sign then will you give that we may see it and believe you? What will you do” (John 6:30) Jesus answered “Our ancestors ate the manna in the wilderness; as it is written: ‘He gave them bread from heaven to eat.’ “Jesus said to them, “Very truly I tell you, it is not Moses who has given you the bread from heaven, but it is my Father who gives you the true bread from heaven. For the bread of God is the bread that comes down from heaven and gives life to the world” (John 6:31-33). The people asked for this bread but Jesus gives them an object lesson, “I am the bread of life. Whoever comes to me will never go hungry, and whoever believes in me will never be thirsty” (John 6:35). Here in John chapter six Jesus identifies Himself as the source of that bread in the wilderness and He is talking about more than a physical existence of life but eternal life as He is that bread…the very Bread of Life. Why do I say that? Because Jesus said that like the manna that came down from heaven, He came down from heaven to give life (John 6:38), but this life was eternal life and not a temporary physical sustenance (John 6:41). Some of His disciples grumbled against what Jesus said just as they did in the wilderness so Jesus says, “Your ancestors ate the manna in the wilderness, yet they died. But here is the bread that comes down from heaven, which anyone may eat and not die. I am the living bread that came down from heaven. Whoever eats this bread will live forever. This bread is my flesh, which I will give for the life of the world” (John 6:49-51). They still didn’t get it so again Jesus says, even more clearly, “Just as the living Father sent me and I live because of the Father, so the one who feeds on me will live because of me. This is the bread that came down from heaven. Your ancestors ate manna and died, but whoever feeds on this bread will live forever” (John 6:57-58). What Jesus was saying precisely was that He was that bread from heaven…that living source of bread but this bread gives eternal life, not a temporary life. It was after this that “many of his disciples turned back and no longer followed him” when Jesus asked the disciples if they were going to leave too (John 6:66-67) Peter answered “Lord, to whom shall we go? You have the words of eternal life. We have come to believe and to know that you are the Holy One of God” (John 6:68-69). That was the right answer that the other disciples didn’t get. They weren’t really Jesus’ disciples at all because they only wanted to eat more of the bread that Jesus had miraculously provided (John 6:26) in the feeding of the five thousand (John 6:1-13). Sadly, they still only recognized Jesus as a foretold prophet (John 6:14) so they still didn’t recognize Him as the Son of God. Anyone and everyone who believes in Christ as the Son of God, that He lived a sinless life, was crucified for our sins, and raised again to life on the third day, and that they’ve had a time in their lives where they’ve repented of their sins and placed their trust in Him, they have the Bread of Life already and they shall never die (John 6:50). If that is you, then you also know that Jesus is the only One Who has the words of eternal life and by believing in Him, you will never hunger or thirst again (John 6:35). What is it? It’s manna…the Bread of Life and that Bread of Life is Jesus Christ. Great article. Thanks for the insight. Whe praise God because Jesus is our manna from heaven, our living bread. Some really interesting details you have written. May God showers his blessings on you AMEN. Previous post: What Does The Bible Say About Reconciliation Between Believers? Next post: What Does Abomination Mean When Used In The Bible?